If you are looking for an audio experience you can only dream about, you will love the Klip Xtreme® KWS-650. This is a 2.1 stereo speaker system that combines a bold design, Bluetooth® wireless technology and unmatched sound quality. 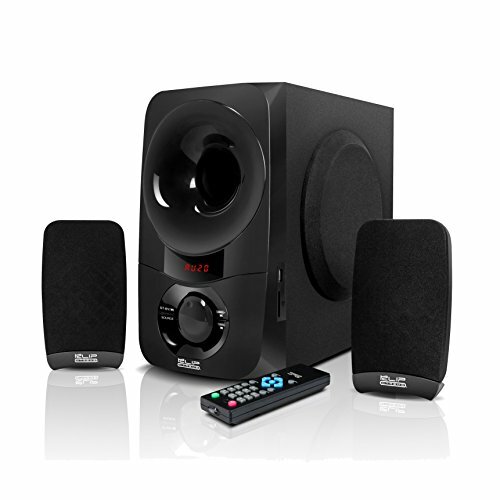 Consisting of two satellite speakers and a powerful subwoofer, it is able to pump 60 watts straight to your ears. What´s more, you can exercise complete control over your music by selecting your tracks, adjusting the volume or bass controls whether form main unit or through the wireless remote. Your musical and theater experience is enhanced by the rich and deep bass effects delivered by the acoustically balanced wood cabinet of the subwoofer, making this system an exquisite addition to your entertainment room. Klip BluPulse Stereo System 2.1 Channel, Immersive 360-degree sound for Crystal-Clear, Room-Filling Audio- Bluetooth wireless, 120 Watt Peak Power, 60W RMS with 2 Satellite of 3" Drivers, 1 Sub of 5.25" Driver to Bring the Noise! If you have any questions about this product by Klip xtreme, contact us by completing and submitting the form below. If you are looking for a specif part number, please include it with your message.